Tried this side by side with the 10 yo Red Stripe 55.7%... I got a feeling this contains older Laphroaigs than the Red Stripe... deeper. more concentrated, earthy nose and palate... some reviews mentioned this as slightly fruity, but seriously, I didn't detect much of the fruits, but it is a tour-de-force of a Laphroaig. It is currently winter, and I would love to be drinking this everyday! Nose : Peat smoke, stewed fruits, burnt wood, seabreeze and whiffs of iodine. With aeration, tar, ginger, earthy notes. Mouth : Peat smoke, ashes, medicinal notes, brine and plenty of delicious combo lemon and pepper. Finish : Long, peaty, smoky, lemony, earthy. The Green Stripe series is famous for being among the best. I must agree. This dram was superb. 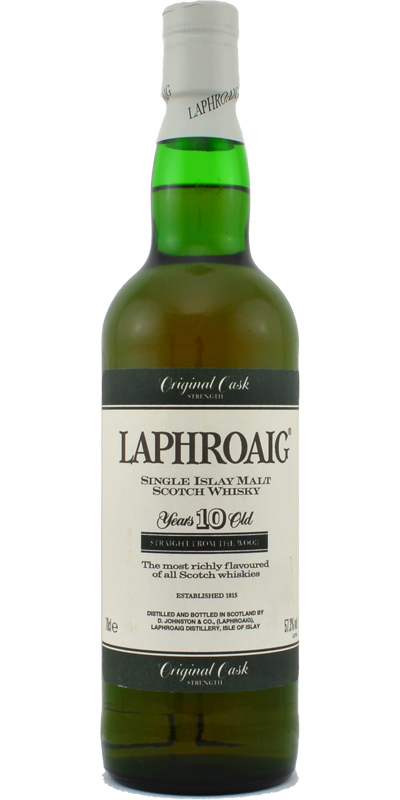 This is what Laphroaig 10 is al about. Complex and so well-balanced. Inmense,but fragrant, with herbal notes; Yellow Chartreuse ,angelica, Suze-like gentian, savoury and anise before the kelp kicks in, alongside heavier oils and phenols . This brightness contrasts with the tarry background. Huge smoke from the instant it hits the lip. Coal tar builds. There's the nutty sweetness seen on the nose. It's this sweet element that is accentuated with water. adding texture and balance. Oily and lengthy, with some bay leaf. With water: More grass, minerals, sea salt and fruits. Smoke, iodine, burned banana and papaya, sea salt, mineral, wet grass, medicinal, iron, very earthy, ginger. Ginger, TCP, machine oil, very earthy, sweet sea salt. Long. Peat, sweet bonfire and machine oil covered with earth. It's the good old Laphroaig as I first tasted it, only more of it, more peat, more tar, more sea, more iodine, more alcohol, more everything... I love it! Only thing not to like about this one is that my bottle is now empty. The alcohol is too strong, 2 drops of water and it's heaven.